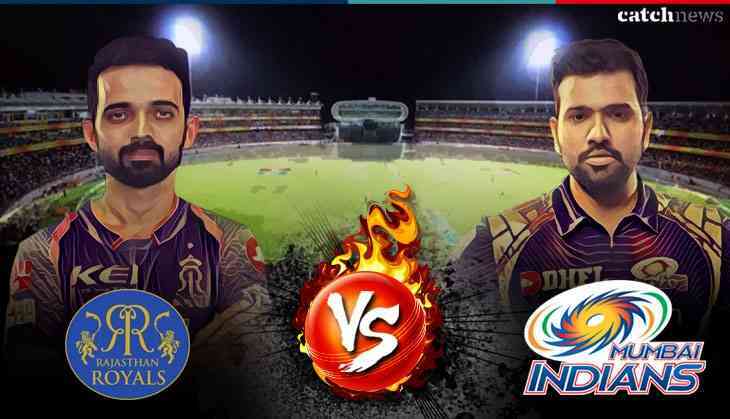 The 21st match of the Indian Premier League (IPL) is between Rohit Sharma led team Mumbai Indians and Ajinkya Rahane's team Rajasthan Royals. One hand there is Rajasthan Royals that won the tournament in the first season and on another other hand there is Mumbai Indians who are the most winning team of IPL as they have won the title three times. Ajinkya Rahane who is newly appointed captain will have to take charge against three times winner Rohit Sharma. Thus Rahane will try hard to get back to their winning momentum whether Mumbai Indians skipper Rohit Sharma is no mood to get back after winning their first match in the tournament. Moreover, while it comes to squad power then surely Mumbai Indians has much stronger than Rajasthan Royals but let should not forget that Rajasthan will be playing in their home ground so they could give a tough competition to Mumbains. Rahane led team has a confidence after winning the high scoring match against Royal Challengers Bangalore and on the same Mumbai will also boost their confidence after defeating RCB. While talking about the history and records then Mumbai Indians has been seen heavy on Rajasthan Royals. They both have played 16 matches till now and in 16, Mumbai Indians won whether Rajasthan Royals got 6 matches in their bag. Ajinkya Rahane (C), Ankit Sharma Anureet Singh Jofra Archer Stuart Binny Aryaman Birla Jos Buttler (W) Dushmantha Chameera Prashant Chopra Shreyas Gopal Krishnappa Gowtham Heinrich Klaasen Dhawal Kulkarni Ben Laughlin Mahipal Lomror Sudhesan Midhun Sanju Samson Jatin Saxena D'Arcy Short Ish Sodhi Ben Stokes Rahul Tripathi Jaydev Unadkat.